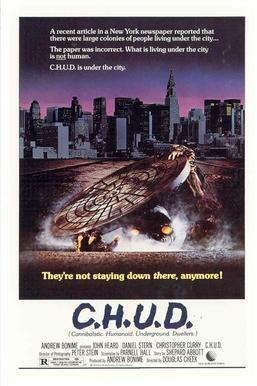 An urban scum outlier released in the height of the slasher boom, C.H.U.D. ain’t a total dud, bringing with it an embarrassment of riches when it comes to acting talent (John Heard, Daniel Stern, Christopher Curry, John Goodman, Jay Thomas). Still, for most horror heads, this one is best known for its iconic poster, one of the all-time best in the genre, a throwback to what the movie really is: a 50s creature feature, except using a smelly, Bowery/Lower Manhattan milieu for gobs of atmosphere. As chatty as any horror movie ever, C.H.U.D (aka, Cannibalistic Humanoid Underground Dwellers) features George, a fashion photographer whose photojournalism focuses on the city’s down-and-outs. All the while, homeless people are going missing, something that has not gone unnoticed by a Soho soup kitchen worker, AJ (the wonderful Daniel Stern) who tries to tip off police. Local NYPD finally gets involved, but only when a captain’s wife goes AWOL, and true to 50s sci fi form, there’s a stonewalling baddy in the form of a nuclear regulatory commissioner who knows more than he lets on. C.H.U.D. plays upon the urban legend of something living in the New York City sewers a la Lewis Teagues/John Sayles’ wonderful Robert Forster-starrer, Alligator. However, it lacks the biting (sorry) humor and shocks of that one. The “rubber monsters in a suit” are casually reminiscent of the The Creature from the Black Lagoon, crossed with the “lead demon” in Demons. And they’re pretty darn good. The improbably-named director, Douglas Cheek, keeps the beasts nicely hidden and wisely focuses on understatement and buildup. For our money though, Street Trash is the king of all bumsploitation flicks, an audacious, grimy, disgusting (and highly memorable) flick, also set in derelict 80s NYC. Still, C.H.U.D. has held up fairly well. It’s smarter and better-acted than it has a right to be. However, this subterranean horror isn’t done any favors with downtempo pacing. CHECK OUT OUR PODCAST DISCUSSION OF CHUD! This entry was posted in Science fiction and tagged 80s horror movies, monster movies by Really Awful Movies. Bookmark the permalink. I always liked CHUD. It’s kind of like Humanoids From The Deap.